In many European countries there is an increasing interest in the use of roundabouts instead of signalized intersections. Concrete roundabouts provide sufficient strength to withstand the stresses induced by intense and heavy traffic and offer a safe and continuous traffic flow. 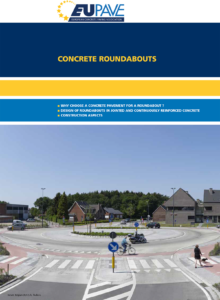 This publication helps designers, engineers and decision makers by presenting the advantages of concrete roundabouts and the design and construction aspects of a jointed plain, a jointed reinforced or a continuously reinforced concrete pavement.